Well, as of this morning we’re still “babysitting” our field near Duke, Oklahoma. We're in hopes it will dry out enough that we can get going later this afternoon. Yesterday, after looking through all of the photos I have taken in the last couple weeks I realized how many neat ones there really are. I’m the type of person where I see a moment or scene and think, or often enthusiastically say, “photo op!” (which seems to be a college slang term for “photo opportunity”). With that being said, you can only imagine the amount of pictures I have taken since the beginning of our harvest season. Even though the boys often gripe that I’m constantly taking pictures of them and always wear my camera on my hip, I don’t ever want to miss a moment. After all, as the saying goes, “A picture is worth a thousand words.” So please, sit back, get your clicker finger ready, and enjoy some southern Oklahoma harvest - Roland style. Wheat harvest for Misener Family Harvesters has officially started and it sure didn't take long to get back into the swing of things. Harvest hasn't quite started for the Misener Family, so we're keeping busy with things around the shop. Some of the things we're doing is inspecting our combines, tightening chains and belts, doing some preventative maintenance by changing bearings that are nearly worn out, and cleaning cabs. Some might find this a little tedious, but this is the kind of work that keeps us running in the fields when harvest is in full bloom. No breakdowns in the fields means more wheat we can cut in a shorter amount of time. Not only do we appreciate this, but our customers appreciate it even more. It's nice to know your whole livelihood is gathered up and no longer sitting in the vulnerable field. 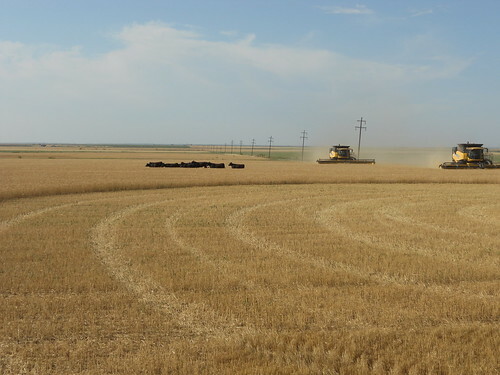 Rain has halted wheat harvest progress in parts of Texas and Oklahoma, but was welcomed as portions of the area are still in need of moisture. Overall, the wheat crop remains ahead of schedule and has been reporting above average yields in places. Texas – Portions of South and West Texas received up to six inches of rain last week while other areas only received scattered showers. Wheat and oats are being green chopped or baled for hay, and many grain producers have began harvesting or are preparing for harvest. Several who have started to harvest have reported above average yields. The High Plains is seeing irrigated wheat in good condition, while dryland wheat remains in need of moisture. In North Texas harvest was on hold due to rainy conditions. 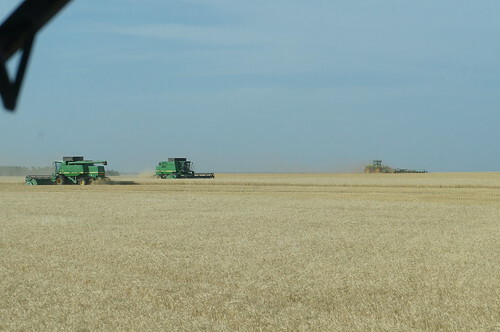 Oklahoma – Harvest continues to progress, but weekend rain showers stopped combines in southwestern Oklahoma. Wheat in the Panhandle is still in need of rain, although the state received rain in portions of South Central and Southwest districts. Cooler temperatures in the mid to low sixties have continued to halt harvest. Conditions have been rated mostly good, and 80 percent of wheat heading is in soft dough stage—44 points ahead of t he five year average.